When I was in Milwaukee recently on a Friday, my sister said she knew the perfect place for a family get-together and a great fish fry. She was right! We had a really good Fish Fry at Saz's State House. I sure wish they had a branch in Lake Mary! We had a very nice Fish Fry here and I'd return in a moment. Saz's is somewhat known locally in Milwaukee for their Ribs and for their participation in sporting events--they are blocks away from Miller Park, the home of the Milwaukee Brewers. But we went there on a Friday night specifically for their Fish Fry and we were not disappointed. There were about a dozen of us and we had a reservation, so no waiting, though when we left they were busy and I'm told that sometimes there is a long wait. But not for us. After taking and delivering our drink orders (mostly beer--we were in Milwaukee, WI after all! ), we ordered. 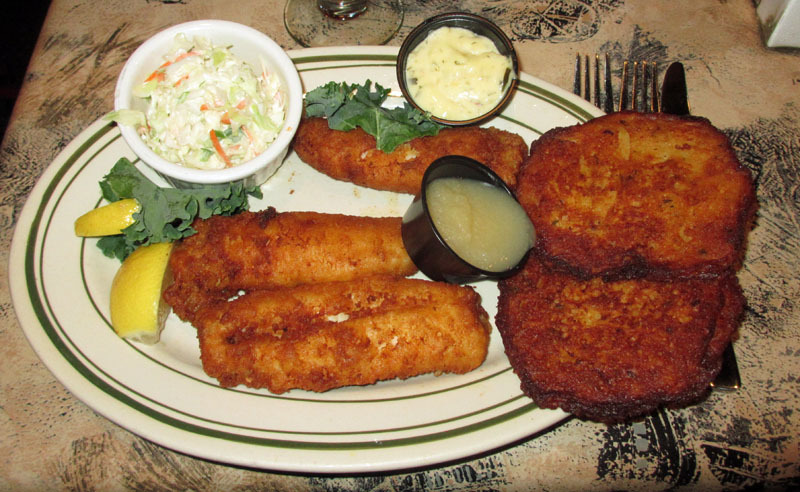 I had the fish fry and I have to say, my fish was perfectly breaded and deep fried--to perfection. The fish was moist and flaky, the breading was not greasy at all. I had the coleslaw and potato pancakes. The potato pancakes were fairly thin and a bit overcooked as a result--thicker would have been better. The coleslaw was a bit dull--it could have used a bit of acid, I thought. And one thing never made it to my plate--the bread. Yes, the waitress should have noticed this but did not. One or two of our party had to ask for missing items, but I figured I had enough to eat, and i was right. In general it was good, but the Fish--for which a Fish Fry is named--was the highlight and was wonderful. I would return again, just for the fish. You may be tempted to quizzically ask me "Denny's?" 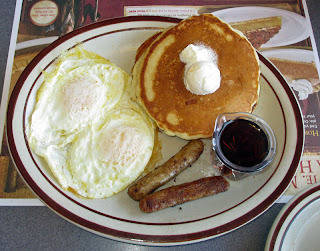 But my recent breakfast here tells me why people eat at Denny's, and this location (Sanford, FL) in particular. The service was warm, friendly, and fast. The food came out quickly and was hot and decent. And the price really can't be beat. Though I'm not a big fan of chains, especially large chains, they certainly have their place and they generally bring consistency and value, when the individual restaurant is run properly. I think this one qualifies. We arrived and were quickly seated and given menus and a beverage order taken. In quick order, after a few questions and suggestions from our waitress, we ordered. I elected to have the Senior Omelette. I could not have been more satisfied with what I got. 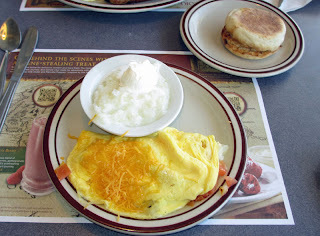 Two eggs had been made into and omlette stuffed with onions, tomatoes, bacon, cheddar cheese and diced tomatoes. It was delicious. Not overcooked, it tasted fresh and light, in large part due to the tomatoes. It was served, as requested, with grits (they needed a bit of salt, definitely) and and English muffin. It was very good and I was very pleased. I guess I'm a bit of a Denny's fan once again! 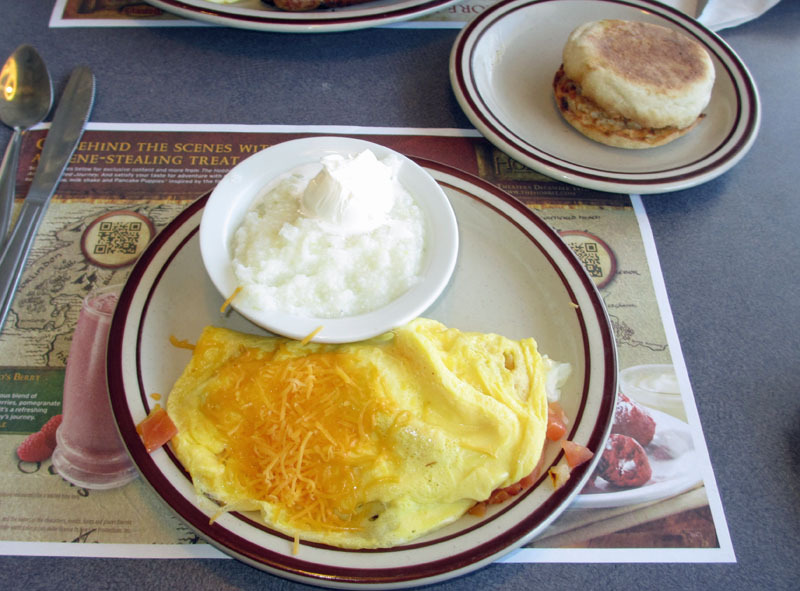 My friend Tommy ordered a "what you want" type of breakfast--he told the waitress what he wanted and she was able to tell him the best menu selection at the best price to get just what his little heart desired--and he got it! Two perfectly fried eggs, over-easy as requested, some sausage links, pancakes, and toast--it was all very good. The eggs came out just as he requested, perfectly cooked. The pancakes were nice and light. It was a delicious meal, no doubt, and we'd eat here again in a heartbeat. I guess if you want a value meal and don't need a lot of frills, this is a great place. And our service throughout was attentive and quick--a lot of more expensive places could take a hint from the great service they provided, fast, friendly and efficient. Give it a try! The Breezeway Restaurant and Bar has about the best patio I know of, a wonderful outdoor seating area that vibrant and, when filled with people a lot of fun. 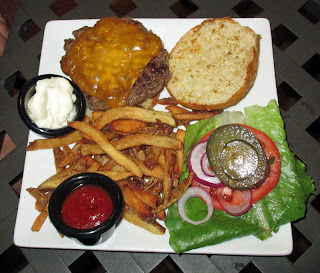 But the food is good too, best described as "American"--that is, a mix of items sure to appeal to most. They pride themselves as the "home of the big fish sandwich" and it is indeed big and good. But give the pork tenderloin sandwich a try as well. As you can see from the pictures in my original review of this place, it's huge. Since I wrote that, I've discovered their Firecracker Shrimp appetizer. So good that I've gone there just for that! Really good food in a fun atmosphere, what more can you ask for? Hollerbach's Willow Tree Cafe is a real German restaurant, transplanted to historic Sanford. Well, it's about as German as you can get outside of Germany and has won many national awards for it's food and atmosphere. Chef/owner Theo Hollerbach is certainly the life of the party here, and can often be found mingling with his guests and enjoying some of that famous German brew. But don't let that fool you, the service and food here is top notch. I have been back there since I wrote my original review and know I'll be back again and again and again. The place is always packed and they have live German (Polka) music on the weekends. It's truly a great place to have fun and good food. La Sirena Gorda Cabana is the newest restaurant in historic Sanford and also has a nice patio, though open-air for the most part. This is a beautifully-decorated space and has a true Mexican feel. And guess what, they serve Mexican food--and it's very good. I've had the Naughty Nachos more times than I want to count--they are excellent. As you can see from the pictures in my original review, the food looks great. But even more so, it tastes fantastic. On top of that, they have a wonderful bar and late night crowd, serving tapas until the wee hours of the morning. It's a great place to hang out with friend--or to make new friends--we have! Marco Dino's Ristorante is right on Magnolia Square in another historic building. Hint: look up at the ceiling! We've eaten there a number of times, and occasionally go there for just two particular items, the Fried Mozzarella and the Tomato Basil Soup. I wrote about the soup in my original review, and I've been back specifically just for that, but everything I've eaten there has been very good and very Italian. Chef Rich Lendino is quite talented and it shows in the food he prepares. This is probably more of a romantic dining place, but certainly fit for the whole family. I'll keep going back, time after time. Angel's Soulfood and BBQ may seem to be a "hole in the wall" type of place, but it has about the best soul food you'll ever find, with huge portions and a great price. This is the place to eat if you really want genuine soul food done right! I've eaten here and loved it as you can read in my original review! The Corner Cafe Restaurant is the home of some great soups and sandwiches, and on the weekends they do great dinners. We've been there for both a number of times and keep going back. Chef Michael and his staff do a great job and make you feel like part of the family. And if you read my original review (written when it was named Gourmet 2 Go), I've loved it and so have my friends. The Original Christo's is another great place, a mix of Italian, Pizza, and American food. A great place for some pizza, or to sit on the sidewalk on a nice evening and enjoy good food and friendly service. Since I wrote my original review, I've been back a number of times and always impressed with the food and service. Historic Downtown Sanford is a great and fun place to visit, and has some wonderful places to eat and hang out. I heartily recommend any and all of the above. Chances are, you might run into me here at one of these places. We had a very nice dinner at Blue Elephant in Lake Mary. Based on my first visit, I will definitely go back again. Blue Elephant has only been open a few months, but is first of all a beautiful restaurant. They did a good job remodeling this space that was formerly a Carlos N Charlies. But it's not all good looks--the food was really good as well and the service really attentive. I can't wait to go back! We arrived on a Friday evening around 8 or so and were promptly greeted and given our choice of seating. They were not packed, but seemed to have a steady business. We started out with some wine while we studied the menu. We elected to begin with an appetizer, the Blue Elephant Dumplings. Let me warn you: there are quite a few items on the appetizer that look really good. I can't wait to try some others. 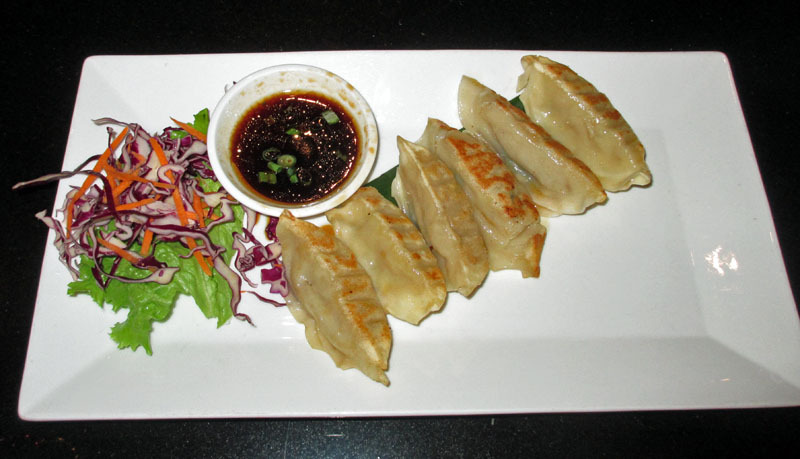 The dumplings or pot-stickers were chicken served with a soy viniagrette sauce and a bit of red cabbage/carrot slaw. They were excellent. They had a nice asian flavor, probably from napa cabbage. The soy viniagrette was one of the best potsticker sauces I've had, perhaps because it was not overly salty, but rather light and flavorful. This was an excellent start to our meal. 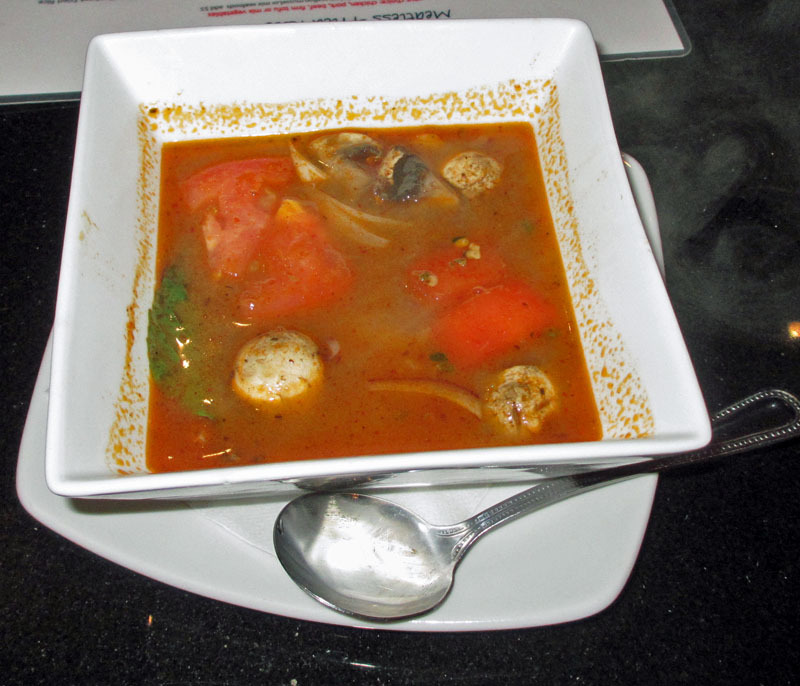 I elected to have the Tom Yum Koong soup to start my meal. I was asked how spicy I wanted it and I said "regular spicy" or medium. It was very good. I'd say there was less lemongrass than I've normally had, but the broth was a bit darker, most likely due to tomato which added a nice umami taste to it. Several large shrimp were in it as well as the normal "mystery" ingredients. It was excellent and I'd definitely order it again. For my main course, I had the Fried Brown Rice Cashew Nut, and it was absolutely wonderful! 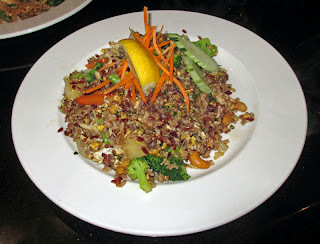 First, the brown rice gave it a wonderful nutty flavor. then add some cashews for even more nuttty flavor. The add in a bit of pineapple for some sweet contrast. Then some egg, carrot, onion, and broccoli--and some chicken to boot. Talk about a flavor festival going on in my mouth! This was excellent and I ate every bit that was on my plate. And yes, I did add a bit of the lemon, it gave it just the right zing! 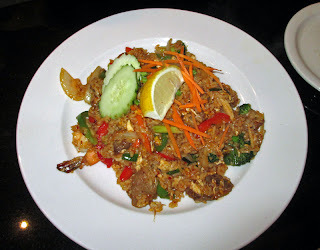 Tommy ordered the Blue Elephant Fried Rice which was equally excellent, a combination of chicken, beef and shrimp with green onion, peas, onion, carrot pepper, tomato, and egg. Wow, what a lot of flavor on that plate. I had a taste and I have to agree with him--it was very, very good. We had a great dining experience here with good food, a reasonable price for the wonderful atmosphere, and great service. I hope to make it here for lunch soon and try some of their lunch specials. But I know we'll be back again for more of their good food. As for whether or not it is genuine Thai food, I have no idea. But that, to me, is of no consequence, because the food was genuinely very good. I'll be back, I'm sure! 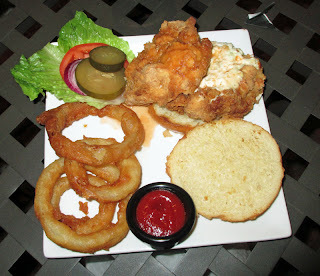 We ate at 4th Street Bar and Grill recently, a newly opened restaurant in "downtown" Lake Mary. It was pretty good and I think that, with a bit of time to mature, it could be really good. 4th Street Bar and Grill is brand new, in a brand new building, and they've done a fine job. The theme is somewhat "sports bar" with well over a dozen large, flat-screen televisions all around. When we were there the Dolphins were playing, among other things. We entered and were promptly greeted by the hostess and offered our choice of seating. We elected to sit on the spacious patio--it was a warm December night and on one end a fireplace was going. It was nicely lit as well and even has TVs outside. Soon our waitress, Caitlin, came by and took our drink and appetizer order. 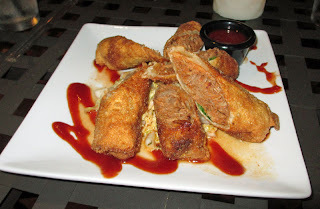 We began with the Pulled Pork Eggroll which was three wontons that had been wrapped around pulled pork, eggroll-style, and were served over a spicy slaw with a beer BBQ dipping sauce. They were very good. Now, in all honesty, each aspect by itself was OK. The pulled pork eggroll alone could have used a touch of salt and was warm inside but not steaming hot. But, when you took a bit of all three aspects together, the pulled pork eggroll, the spicy slaw, and the beer BBQ sauce, it was fantastic, absolutely wonderful. I would order this again in a heartbeat. But i do have to wonder if people who would not think to try all three elements together would enjoy it as much as I did. No matter, this was an excellent dish! 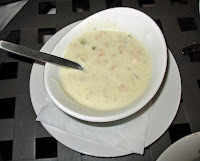 Tommy ordered the Clam Chowder, New England Style (we had to ask before we ordered, the waitress did not know what type it was) and, while it was indeed very good, it came out with what Tommy considers to be a big void--no crackers! He likes his crackers. Nevertheless, the soup was indeed delicious and it disappeared in short order. For my main course, I ordered a sandwich called the Stuffalo. A brioche Kasier roll was topped with two large pieces of chicken breast that had been stuffed with blue cheese, breaded and fried, and coated with a house buffalo sauce. The sandwich itself was huge, though within seconds I relegated one of the chicken pieces to the plate--two were too much. The sandwich itself tasted great, the chicken was tender, the blue cheese maybe just a bit overwhelming, and the buffalo sauce added a nice gentle heat. It was a big messy, though, and some of the sauce was on the plate under the bun. This resulted in very sticky fingers. Overall, it was a delicious sandwich. I ordered mine with onion rings and they were truly delicious, nicely breaded and fried. One of the best things I ate, however, were the pickles. According to the menu, they are made in-house. They were awesome, I wish I could make some that would turn out that good. Oh, and after I finished my sandwich, i still have another piece of chicken to eat. Tommy had the Classic Burger, a regular hamburger topped with Cheddar Cheese, served on a Brioche Kaiser roll with LTOP (lettuce, tomato, onion, pickle) on the side. It was accompanied with fries. Unfortunately, it came out with fries that were barely warm. However, when we told the waitress, she promptly took care of that and quickly returned with nice, hot fries. Still, it should not have come out of the kitchen that way, but the did make it right, an quickly. The burger was supposed to be medium, but it was actually well-done. They have quite a few burgers on the menu. They need to learn to cook a burger correctly. It was good, but not quite as ordered. The burger was, however, quite good and tasty, so no big complaint there. And it appeared with some mayo on the side, just as requested. As I said, the meal here was pretty good, and I'd go back. But there were a few missteps as well. I've already mentioned the overcooked burger and the warm fries and the "wet" bun I had, the kitchen needs to pay a bit more attention to detail. But the service also needs a bit of fine tuning. After we finished our appetizer, the empty plates sat for a bit. Several other servers walked by, but no one else offered to remove the plates. That would have been nice. And when our waitress did remove them, she also took our tableware, but did not immediate provide replacement. So, when our food arrived, we had no utensils, and had to ask for them. Not a huge deal, but shows a bit of inexperience. I hope they'll fine tune a bit and with time, this could be a really good place. I live and work in Lake Mary, and 4th Street Bar and Grill has an $8 lunch special, a limited selection of half sandwich with half salad (or soup). I think we'll have to give this a try for lunch some time. And based on my first visit, I'll be happy to return another time and see how they've improved. They've only been open a few weeks, so I expected a few rough edges. Hopefully they'll get them fixed and turn into a top-notch place to dine in Lake Mary. Wow, great BBQ in Savannah at Barne's BBQ Express. And the BBQ sauce had just a touch a mustard, very South Carolina-ey. I loved it. I had the pulled pork, and it was awesome. Not greasy, but with a great smoke flavor and a very evident smoke ring. I also had baked beans that were nice and smoky and had some of the BBQ sauce and meat flavor as well, and coleslaw which was good. Excellent. Tommy had a BBQ sandwich that came with coleslaw and cheese on it. He loved it. For his side he had the rice, it was a bit spicy but a great flavor. You order at the counter and they bring it out to you. Nice setting and the food was wonderful. Yumm. Great BBQ in Savannah. I'm happy! I'd eat here again---and again--and again, if I lived in Savannah. Wonderful! We decided to try The Olde Pink House in Savannah, GA for a truly upscale dinner on a recent visit, and we were not at all disappointed, it was a great experience, start to finish. We were told reservations were needed or there'd be a 40 minute wait, but then when we got there they said we could eat in the bar area or the tavern. We went to the bar and it was on the ground level, open to the outside, with tables in and out. They said 10 or so minute wait and so we found a spot at the bar (as another couple was led to their table) and had some wine while waiting. Tommy had the She Crab soup, it was excellent, not too salty, and a nice crab flavor. I had a salad, it came out dressed without the requested dressing on the side and when our server saw that, offered to get me what I ordered, but it was OK and not overly dressed, a nice salad. For dinner I had pan fried salmon over horseradish potatoes with a bit of cucumber/radish salad on top. It was excellent. The potatoes could have used just a bit more horseradish for me, it was very subtle, but it was good. The salmon was cooked perfectly. Tommy had the pork tenderloins with sweet potatoes and asparagus. The pork was nicely flavored and extremely tender. The sweet potato was good and the asparagus nice with a bit of crisp, just the way I like it. Afterward we toured the house a bit, it's an olde house and quite swanky, I can see why there's a wait to eat in the main dining rooms...there are a bunch of them first and second floor. Very nice. The name may be a bit funny, and it may be in a tourist district, but there was nothing funny about the good New York style pizza we had at Vinnie Van Go-Go's in Savannah recently. It was a real hit! We had a New York Style pepperoni and mushroom pizza here. It was excellent, the crust was great and it was cooked perfectly--all that a NY style pizza should be. The medium was more than enough for the two of us. Yumm. We were in search of dinner when we were in Savanna recently, but were not overly hungry, so we settled upon Your Pie. We were glad we did. We had a special, minus the green peppers. It has pepperoni, sausage, and green and black olives. We had the small and it was more than enough for two of us. The crust was excellent, nice and crispy. The toppings were warm but not hot, probably because there were a lot of them and the pizza was pulled when the crust was done. But still this was excellent pizza. I'd certainly recommend this as a great place for some very good pizza. Definitely good eats! We stopped at Sgt White's Restaurant for lunch when were were passing through Beaufort, SC, on our recent vacation and were in for a real surprise: great home cooking at a little hole-in-the-wall place. We had good food and left full--what more can you ask for? We walked into this place and I could only describe it as a "dive." But don't get the wrong impression, the food was good, the place was clean, and we had a great experience. Plastic/foam plates, plastic silverware, old fashioned tablecloths--it did not matter--the food was good and truly home cooking. I ordered the Pulled Pork plate with three sides, fried okra, corn, and mac n cheese. It was served with a nice big hunk of cornbread. The pork was great--it was tender and had a very nice smoky flavor that was not obscured by a lot of sauce. The fried okra was excellent, about the best I've ever had. The corn was very good though quite starchy--but that did not matter, it was cooked and flavored well. And the mac n cheese, though not very creamy, had a good cheesy flavor. I thoroughly enjoyed my meal. Tommy ordered the Pork Chop Plate. Wow! Two fried pork chops! Yumm, they were very tender and fried nicely. He also had the corn and mac n cheese, but also some sweet potato casserole that was very good, tender and flavorful. The best part of the experience... when we first ordered, they were a bit busy. So she told us, just pay me later! So we didn't even pay until after we ate. No fancy POS or anything else here, just plenty of good food and good folk. I can see why the seemed to be doing a great take-out business. I'd eat here a lot if I lived nearby! We had an OK, average dinner at O'Charley's when we were in Hendersonville overnight on our recent vacation. Nothing spectacular, but it was OK food. It was OK. I had a nice salad, just iceberg but nice and fresh, was very good. And filling. I had a fried fish and shrimp combo, with broccoli for the side. It was OK, but nothing spectacular. The broccoli was good but I thought a few of the pieces were a bit old. The fish was good. The shrimp were small, very small, and heavily breaded. Tommy had a sirloin steak, medium rare. It was just that. A bit tough but not too bad. The smashed potatoes were very good, nice chunks in it, etc. Very good. We also had desserts, I had key lime, it was too sweet. Tommy had apple cobbler. It was OK. Overall we had an average meal. OK for a chain, but certainly nothing too special either. We had a very good, surprisingly good lunch at the Bistro at the Biltmore Estates on our recent vacation. The service was fast and very good. I think the best bite we had was Tommy's lunch, the Roast Beef Sandwich. It was excellent. The roast beef was juicy and tender, and it was served on a very tasty, soft roll. It was really outstanding, everything a good roast beef sandwich should be, and very tender. The fries served with it were hot and crispy, excellent Fries. For my man dish I had the Roast Turkey with Dressing Sandwich. It, too, was excellent, served on a cranberry pecan bread. It was served with a bit of a very flavorful salad on the side. This was a real hit. But before we got to the sandwiches, we each had some soup. Tommy had the squash soup. I'd say the flavors were a bit subdued compared to the soup I had, but still it was a very good soup and you could definitely taste the squash. I had the carrot soup, and it was excellent. It was a bit spicy, and i loved that. The carrots gave it a lot of sweetness, which the spiciness balanced nicely. I liked this a lot. Or service was very good here as well, Giovannie took good care of us. I'd certainly recommend this place for a great bite to eat when visiting the Biltmore, and the prices were pretty reasonable for attraction prices. Tupelo Honey Cafe has been featured a few times on Food Network shows, so when we were in Asheville recently, we decided to give it a try. Maybe my expectation was too high, but i came away satisfied, but not overly impressed. There were some hits and some "eh's" here. We had about a 40 minute wait here (popular place!) but passed that time at a nearby establishment where we had a glass of wine. Once seated, we ordered drinks and an appetizer, the Fried Green Tomatoes. The friend green tomatoes themselves were pretty good, but they were served over some goat cheese grits that needed a bit of salt. It's the attention to little details like that which I found the most annoying here--good food served with something that was just not quite as top notch. By the way, I started with the beer sampler, a nice sample of a few good beers. That sure hit the spot! For my main course, I had the Brian's Shrimp and Grits. Seven large shrimp were cooked well and served over a bed of Goat Cheese Grits and a bit of roasted red pepper sauce. My shrimp were just OK, not too over cooked, but not perfect either. Again, the dish needed just a bit of salt. But with the pepper sauce, the shrimp were nice and spicy. For his main course Tommy had the Southern Fried Chicken Saltimbocca with Country Ham and Mushroom Marsala. It's a mouthfull to say, but it was very good. The most surprising part of the dish, however, was the bed of cheesy mashed cauliflower that it was served on. The chicken, too, was breaded and fried and topped with country ham and melted havarti cheese and a bit of basil. The dish was garnished with a bit of grilled asparagus. This dish was a real hit, very flavorful and delicious. The mushroom marsala was a nice and earthy but sweet component as well. This was the best bite of the meal, for sure. We'd started out with a bowl of Tomato Soup (called ToMAYto or ToMAHto soup) and two spoons. It was very good and had a nice tomato flavor. I'd have served it a bit thicker or with a bit of cream, but still, it was quite good, no major complaints. Overall we had a nice meal here. I think maybe a bit of attention to a few details is needed, but still, I'd come back to try a few of the other things on the menu--it has a lot of good-looking food on it!